Many medications are available in nasal spray form by prescription to treat allergies and other upper respiratory conditions, but fewer are available over the counter to treat cold and flu symptoms. Those that are available over the counter fall into two main categories: decongestants and cromolyn sodium. Common decongestant nasal sprays include Neo-Synephrine (phenylephrine) and Afrin (oxymetazoline). Oxymetazoline may also be sold under the brand names Anefrin Nasal Spray, Dristan Nasal Spray, Mucinex Nasal Spray, Nostrilla Nasal Spray, Zicam Nasal Spray, or Vicks Sinex Nasal Spray. Nasalcrom (cromolyn sodium) prevents allergy-type symptoms such as itching and runny nose. Nasal spray decongestants work by shrinking the blood vessels in the nose, reducing swelling and making it easier to breathe. Most oral decongestants can also cause a jittery feeling or make your heart race, but the nasal sprays have fewer of these side effects because they work directly in the nose rather than going through your entire body. If any of these side effects seem excessive or don't go away, contact your healthcare provider. Nasal spray decongestants such as Afrin should not be used for more than three days and not more than twice in a 24 hour period. They are great for short term, urgent use to relieve congestion, but using them for too long or too frequently can lead to rebound congestion. This means that you will experience more congestion than you did before and will feel the need to use the medication more often and for longer to get relief. The only way to get rid of rebound congestion is to stop using the nasal spray decongestant completely. Talk to your healthcare provider before taking nasal spray decongestants if you have a history of high blood pressure, diabetes, an enlarged prostate gland, thyroid disease or heart disease. They may not be safe for you. Always discuss your other medications and any allergies with your health care provider and your pharmacist. Cromolyn sodium is used to prevent allergy symptoms and may take up to four weeks of continued use to be effective. It is taken 3 to 6 times per day and is administered using a special nasal applicator that should be replaced every 6 months. Because this medication requires continued, long-term use to be effective, it is not a good choice for the treatment of cold and flu symptoms. 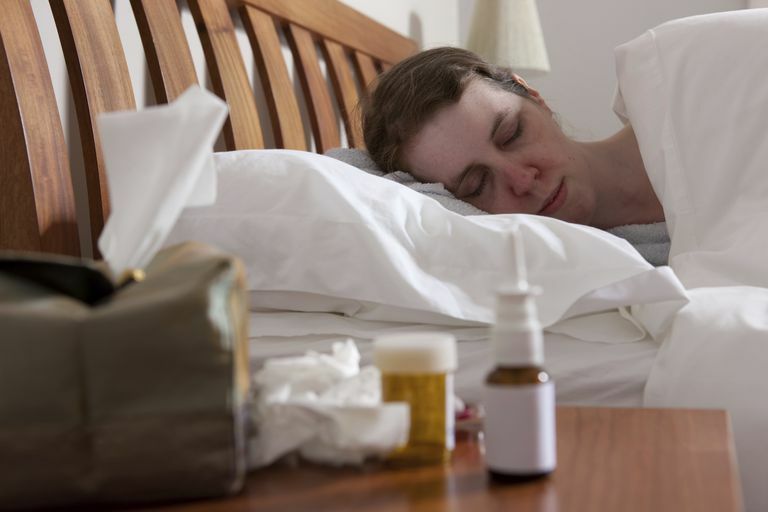 If you are experiencing nasal congestion from a cold, the flu or other upper respiratory infection and oral medications aren't working or you would prefer to try something different, nasal spray decongestants may be an option for you. If you aren't sure or if you have chronic medical issues or could be pregnant, discuss it with your healthcare provider first. Antihistamines, Decongestants and Cold Remedies. Health Information Dec 10. American Academy of Otolaryngology - Head and Neck Surgery. Cromolyn Sodium Nasal Solution. MedlinePlus 28 Aug 13. US National Library of Medicine. Department of Health and Human Services. deShazo, Richard D., MD; Kemp, Stephen F, MD, FACP. Patient Information: Allergic Rhinitis (Seasonal Allergies) (Beyond the Basics). UpToDate 6 May 13. Oxymetazoline Nasal Spray. MedlinePlus 28 Aug 13. US National Library of Medicine. Department of Health and Human Services.